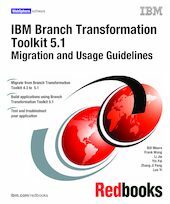 This IBM Redbooks publication shows in detail IBM Branch Transformation Toolkit for WebSphere Studio Version 5.1 and explains how to migrate from Branch Transformation Toolkit Version 4.3 to Branch Transformation Toolkit 5.1. We provide guidelines for the architecture of the target solution, the correct use of migration tools, and migration-sizing. This book also describes how to build new applications in Branch Transformation Toolkit V5.1. We explain both top-down and bottom-up development, and discuss how to use WebSphere Studio and Branch Transformation Toolkit development plug-ins. We also describe rich Java client development using the Branch Transformation Toolkit.